Posted on 5 February 2012 by PaulaPosted in 2012 Picks, TCM PicksTagged 1930s, 1940s, 1950s, carole lombard, classic film, classic movie schedule, classic movies, george sanders, jack lemmon, TCM, TCM Party. One of the treats of Foreign Correspondent for me is Edmund Gwenn, who we all think of as Kris Kringle from Miracle On 34th Street, playing a somewhat inept hit-man. FUN week ahead! looking forward to the parties! Three particular interesting ones this week not partied with before – Foreign Correspondence just due to Mr. Hitchcock’s interesting direction, The Apartment due to Mr. lemmon’s unique greatness! But very interested in Funny Girl as well. Din’t think there are many Streisand fans in our midst. I’ll try my best to be there and sing her praises! See if Mr. Arnstein leaves her this time…Oh My Man, I love him so…. The concept of The Apartment is not a pleasant one, to say the least, but the performances are extraordinary. As is my wont, I look for excellent performances in the supporting actors, and Fred MacMurray’s is one of his best. A severely under-rated actor, he gave so many fine performances in every genre. He’s one of my all-time favorites, and could play a servicable saxophone, which is why it’s used in the My Three Sons TV theme. I agree, Fred MacMurray is a great actor and also underrated. I had no idea until very recently that he played not-so-nice guys in movies like The Apartment and Double Indemnity, all I knew him from was TV reruns. Imagine my surprise when I came across Double Indemnity. Didn’t know that about his saxophone abilities, how cool. Yes, he was good enough to support himself playing in bands and orchestras when he was a young man. I guess it kinda makes sense. Music and acting both require timing. Thank you for all the great info Bernie! I wish I had TMC (or cable, for that matter). I really want to see The Apartment — sounds like such a fun movie! Hi Eric, thanks for stopping by 🙂 the Apartment is a lot of fun (though there’s bits that make me sad & angry too). if you have Netflix, you could get the DVD by Saturday & start it at 10 p.m. EST. I will also look & see if it’s streaming online anywhere. I’ll post the link here if I find it. Hi Paula, thanks for looking into finding an online stream! That YouTube video looks pretty good actually, but I think I’ll just bump up the movie in my Netflix queue and wait for the DVD. I’m worried that having to click from part 1 to 2 to 3, etc. would take me out of the moment, and I wouldn’t get the full experience. Ah Portrait of Jennie, something I watched as a child, believe it or not…….always loved this one. I saw Wait until Dark when it first opened and I literally jumped out of my seat. Love that one. Foreign Correspondent is another old goodie. You can’t go wrong with Hitchcock. I know Val, Wait After Dark still really scares me! it’s scarier than Portrait of Jennie…but I don’t know if I could have handled that as a kid. No, you really can’t go wrong with Hitchcock, even his movies that are considered “lesser works” (like Foreign Correspondent) are really entertaining. Oh man, so many great films here but I don’t have cable 😦 I gotta rent a bunch of these later on, been meaning to see The Apartment for ages. I should check out that Youtube link, after all I saw Paradine Case online too! It’s like I always say: so many movies, so little time! Yep, it seems to be pretty good quality. The only thing, as Eric mentioned, is that it’s in parts & you might not get the full experience. But you could decide if you want to rent it by watching a couple of segments. Paradine Case is another good one, also directed by Hitchcock. Been a while since I saw that. Congratulations on your wonderful looking site! TCM has recently become my Go-To place for films. With a triple feature last week of ‘The Professionals’, ‘The Treasure of the Sierra Madre’ and ‘The Wild Bunch’. My Western fix has been satisfied for weeks to come. 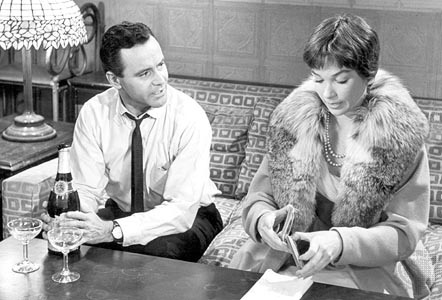 Looking forward to the double bill of ‘Wait Until Dark’ and ‘The Apartment’ this Saturday night. Alan Arkin’s Harry Roat Jr. from Scarsdale is one of the oiliest, quietly creepy bad guy in cinematic history. HI Jack, thanks so much 🙂 You’ll get no argument from me, I really really love TCM! Plus it’s Oscars month, some of the best of the best. And I have to agree, I think Arkin’s really menacing in Wait Until Dark. I actually find that whole movie to be quite disturbing, I guess because Audrey Hepburn’s character is blind and that just makes it all so much worse! If you’re on Twitter, you should stop by the #TCMParty (tweet with that hashtag & I’ll see it). Much appreciate your comments!